Katherine Howe has created a masterpiece with The Physick Book of Deliverance Dane . Her language and writing is unmatched -- and this novel is by far one of the most colorful and beautifully descriptive works of literature I've read in quite some time. Connie Goodwin is dedicated to earning her doctorate from Harvard and becoming a historian. With vast knowledge and specializing in Colonial America (specifically the late 17th-century), Connie is confronted with the opportunity of a lifetime when she is given the task of sorting through her grandmother's ancient home located in Marblehead, Massachusetts, nearly a hop and skip away from Salem. The excitement quickens further when Connie discovers an ancient book in her grandmother's house containing a mysterious key and slip of paper inscribed with the name "Deliverance Dane". Connie then embarks on the ultimate quest to not only uncover new knowledge of previously undiscovered facts from Salem history, but also to learn more about her direct ancestors -- and their direct correlation with witchcraft. 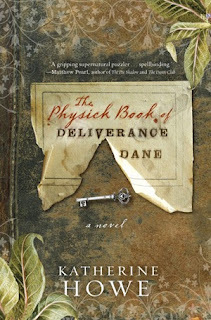 The Physick Book of Deliverance Dane has many redeeming attributes, and the novel truly is a work of art. Howe begins by thrusting readers into a rich academia backdrop and uses intelligent dialogue and vocabulary to strengthen and enrich the tone of the novel without being remotely intimidating. Howe uses such explicit detail to describe everything that you can clearly see and almost smell everything that takes place; from cleaning Connie's grandmother's musty, dirty old house to visiting the vast archives of Widener Library to locate missing historical documents. I could compare my experience reading The Physick Book of Deliverance Dane to drinking a rich, expensive cup of coffee or eating a rare piece of pure, exotic chocolate -- no joke. The book is really that good, and that special. From an intellectual standpoint, Katherine Howe leaves nothing to be desired. She incorporates American History seamlessly into the novel's plot and approaches the subject of witchcraft and alchemy from all different viewpoints; leaving scientists, doctors, philosophers, and those with religious beliefs gaining new perspectives on the matter. The Physick Book of Deliverance Dane will leave you stunned. There are some minor elements of fantasy in the novel but they are done so tastefully, just adding beauty and finality to the overall magic and mystique of the plot. The novel definitely has re-read value, and I absolutely plan on keeping this book in my permanent collection. At this time, Katherine Howe does not have any further novels on deck to be published, but please be sure to visit her website at http://katherinehowe.com/. If you love reading exquisite novels on witchcraft, I do recommend The Witching Hour by Anne Rice and The Secret Circle trilogy by L.J. Smith. While both sets of novels are entertaining, the style of their stories are much different than the beauty of The Physick Book of Deliverance Dane .